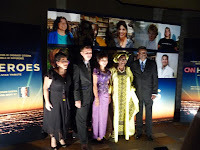 Ethiopia Reads News: Watch Yohannes on CNN Heroes: An All-Star Tribute on Thanksgiving Night! Watch Yohannes on CNN Heroes: An All-Star Tribute on Thanksgiving Night! Ethiopia Reads founder Yohannes Gebregeorgis is one of 10 visionaries honored during CNN Heroes: An All-Star Tribute, airing in a global broadcast tomorrow night. Chosen from 4,000 nominees, Yohannes was named a Hero for his work championing literacy for children in Ethiopia. Tune in to watch Yohannes receive an award from Oscar-winning actor Forest Whitaker, who praises Yohannes for leaving a comfortable life in the United States to pursue a dream of connecting children with books. 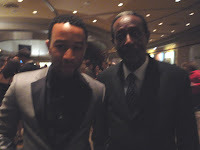 The star-studded celebration is hosted by Anderson Cooper and features musical performances by Alicia Keys, Christina Aguilera and John Legend (pictured here with Yohannes). Other Hollywood luminaries on hand to salute the CNN Heroes include actors Robert Duvall, Meg Ryan, Cameron Diaz and Hugh Jackman. The real stars, however, are the Heroes themselves. Yohannes is in great company among the nine other nominees -- all ordinary people doing inspirational work. Last month, CNN sent a film crew to Ethiopia Reads libraries in Addis Ababa and Awassa. Their moving film will be featured in tomorrow's broadcast and nicely showcases Ethiopia Reads' programs, including the Donkey Mobile Library. Please watch with us, as we share this moment of celebration with all of you -- our friends, volunteers, donors and supporters across the world. Then visit www.ethiopiareads.org to learn more and make a donation in honor of Yohannes, our hero, on this special day. I watched with great interest last night and was very inspired. I work for Global Reach Children's Fund (www.nopoverty.ca) - a Canadian Charitable Organization that is developing a community enrichment project in Sululta, Ethiopia which will include the building of a primary school AND A LIBRARY! We fully support and encourage your continued excellent work in Ethiopia - perhaps we can work together some day! It gets down to choose a correct companion who uses your funds in a right way - that is incorporate it in real business, and shares the profit with me. It gets down to choose a proper partner who utilizes your funds in a right way - that is incorporate it in real deals, parts and divides the profit with me. I appear forward to coming back to read your Ethiopia Reads News post also.